Frozen Synapse: A Simultaneous Turn-Based Strategy Game / Turn-Based Tactical Game! 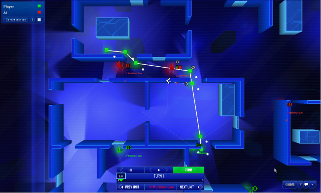 Frozen Synapse is a thrilling PC, Mac, Linux and tablet (iPad) strategy game. It brings the simultaneous turn-based strategy genre bang up-to-date and lets you give detailed, accurate orders to your squad. Classic gameplay with a modern interface! Five challenging multiplayer modes including the innovative bidding-based "Secure" and "Hostage Rescue"
"It's taking action-strategy to a much-needed new place." Each match immediately places you in an intense tactical situation: there's no waiting around for the fun part. Blast a hole in a wall with a rocket and then send in your close-range units, or take a stealthy approach and set up cover with a sniper: your approach is entirely down to your own creativity. If you can predict your opponent's moves, you can win the match: this game has been crafted so that superior tactics will triumph! Once you've outwitted your opponent with a series of perfect turns, watch your Global Ranking climb and export the resuts to YouTube instantly! If you're a fan of classic squad-based games you'll love this modern update that's achieving critical praise from every quarter! Sign up to our mailing list - we won't spam you or sell your sweet, sweet details for money - promise! This small button will send you spiralling into the depths of our IRC channel, right inside your browser!